This style of whole dried chiles is one of the most important ingredients when it comes to adding the most powerful burning chile heat to Thai recipes. These really pack a punch, and we love them. Very high quality. Add authentic, hot spicy flavor to all kinds of stir fry and fried rice dishes. These are the best quality we've ever seen available, and 2 of 100g. pack is a nice large size that will last. Made to the highest quality specs Thailand's. Dried chili is an essential ingredient for making hot chili oil, chili past or Sichuan hotpot. 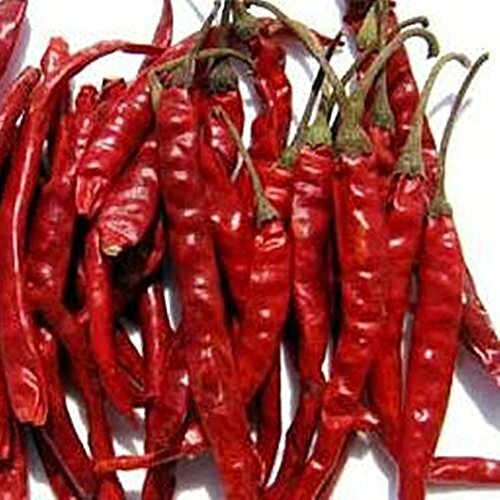 Red dried chili peppers can be pan fried or dry roasted together for garnish. If you have any questions about this product by chantubtim, contact us by completing and submitting the form below. If you are looking for a specif part number, please include it with your message.